THE WILDCATS’ days are numbered as Wakefield Trinity get set for a revival. The Wildcats suffix, introduced when Wakefield Trinity joined Super League in 1999, will be dropped from the end of this season, chairman Michael Carter has confirmed. Explaining the change, Carter said: “We have got a fantastic heritage within this club and I don’t think we have made the most of it. In the 1960s we were a fantastic club, winning Championships and Challenge Cups. We have the world record points scorer associated with Wakefield Trinity and I don’t care who comes along, they will never beat Neil Fox’s record. Carter is confident the change will not deter the club’s younger supporters, who have only known the Wildcats name. 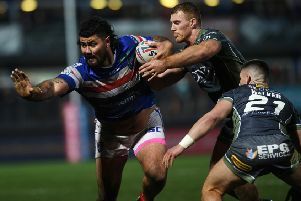 The team will be known as Wakefield Trinity Wildcats for Friday’s trip to Salford Red Devils, but there is a possibility the traditional name could be used for the final third of the season. Sunday’s win left Wakefield sixth in First Utility Super League and Carter is confident about the future. He said: “I think in the next couple of weeks we will probably have another couple signed up for next year, which will take us to 25 or 26 players for 2017 already.